The houseboat's eleven foot ceilings with exposed beams, ceiling fans and air conditioning, provide a feeling of spaciousness and comfort. A full size refrigerator, sink, microwave and cook-top stove makes cooking easy.It has a comfortably sized bathroom with a full size shower. The Master Bedroom has a queen sized bed, closet storage and a patio door leading to a private deck. Two twin beds in the sleeping loft are a great spot for kids, and the sleep sofa and aero bed provide additional sleeping options. There is one parking spot that comes with this rental and a parking lot down the street with daily rates. • Rates are posted for 2 guests. Each additional guest $35/night per person. $149 cleaning fee, $39 insurance fee. • Holiday rates are higher. • Guests must electronically sign off on our SleepAfloat Rental Terms & Conditions within 48 hours of booking to validate confirmation. Close to Old City, galleries, restaurants and bustle, but once we went through the marina gates it was peaceful and relaxing. Best of both worlds. Spotless, comfortable bed, plenty of hot water. Looking forward to planning a return visit! The toilet onboard is barely adequate for #1...don't even attempt #2...enough said....Manager was very responsive and informative...great restaurants and historic sites within walking distance! Loved the marina cafe! Thanks so much!!! My daughter & I enjoyed staying on board this cozy houseboat. It was more spacious than I expected and the location was perfect. The property is clean, just the right size for us. It has all the basic necessities but the toilet is unique! The "upper deck" with the lounge chairs and the view of the marina was our favorite spot. Very relaxing! great location! 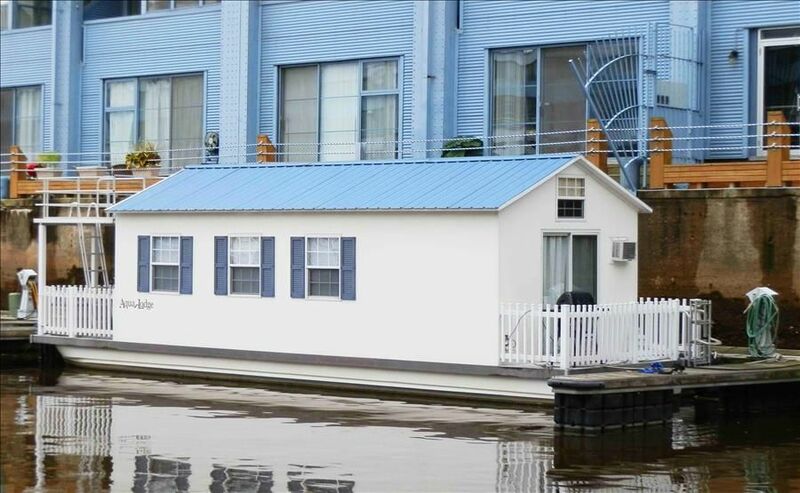 houseboat has everything you need. Our first stay on a houseboat and won't be the last. The Pisces got us hooked on this type of accommodation. Once you get use to the little quirks of staying on the water, it's so much better than staying at a hotel. We had great views and eas very relaxing on the upper deck. Even though the square footage is small, there's plenty of areas to escape to. Kitchen and bathroom, though compact, were well equipped. Plenty of places to store our belongings and we're not light packers. You mustn't mind walking to stay here, but everything you need is a short walk and picturesque along the Delaware. Close walk to Old City, too. Jack was very accommodating to our arrival time and acquainting us to the houseboat. Definitely returning and telling others about it. Thanks! The boat was close to the attractions we want to see and many restaurants.